Warning: This post contains spoilers for Star Wars: The Clone Wars. Read on at your own peril. Also, I wrote this before Lucasfilm announced that Lupita Nyong’o and Gwendoline Christie were joining the cast of Star Wars Episode VII. That said, my point still stands. In the wake of being rather furious disheartened in the casting for Star Wars Episode VII: Something Something Darkside, I found myself all the more sucker punched by the season five finale of Star Wars: The Clone Wars. Therein, Ahsoka Tano, Anakin Skywalker’s padawan, faces her great trial: the final ordeal a Jedi apprentice must endure before being promoted to the rank of full Jedi knight. In the aftermath of being wrongfully expelled from the Jedi Order, Ahsoka receives a half-hearted apology from the Jedi council and an offer to return to the fold. Instead, Ahsoka chooses to walk away from the Order. The scene itself is Star Wars at its most emotionally resonant. Over five seasons of The Clone Wars, Ahsoka Tano became one of the best things to ever happen to the Star Wars franchise. Through Ahsoka’s growth as a Jedi, the audience gains a better view into Anakin Skywalker’s inability to embrace the Jedi virtue of detachment. Ahsoka also manages to rein in Anakin when his passions get the better of him. One episode in particular sees Anakin leading a squadron of Y-Wings on a raid against a droid battleship. When Anakin orders his squadron to press the attack, despite taking heavy losses, it is Ahsoka who forces him to recognize that he is throwing away the lives of his pilots. Amid the moral ambiguity that defines Anakin during The Clone Wars, Ahsoka constantly reminds Anakin of what he should be as a Jedi. Absent his apprentice in the sixth season, we see Anakin rapidly transforming into a creature of anger and passion. This raises something of an interesting question for Anakin’s eventual transformation into Darth Vader. Specifically, does Vader forsake his bond with Ahsoka during the Jedi purge? Ahsoka left the Jedi because she felt that they betrayed her in the aftermath of the bombing of the Jedi temple. Similarly, Anakin rationalized his atrocities through a warped interpretation of the Jedi Council’s decision to arrest the Chancellor. Suppose then that Vader saw fit to keep Ahsoka’s name off the proscription list. Let us also suppose that in the wake of the purge, Ahsoka managed to maintain a quiet life on the Outer Rim. Around the time Luke Skywalker was earning his stripes as a Jedi knight, Ahsoka would have likely been in her 40s, likely sensing a great disturbance in the force as her former mentor died at the hands of the Emperor. Skip ahead another twenty years to when Star Wars 7 is supposedly happening, and it is perfectly conceivable that Ahsoka would still be alive. Alright, Adam, enough faffing about. What’s your damn point already? My point is simple: where is Ahsoka? Ahsoka may have left the Jedi order, but any half talented writer could see their way to writing her back into the story once Luke took it upon himself to restore the Jedi as the galaxy’s peacekeepers. 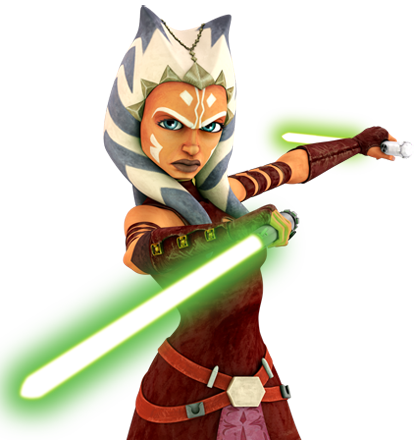 When we get right down to it, Ahsoka has had more Jedi training than Luke, himself. She would be the perfect person to help him restore the Order. Yet, notwithstanding a J.J. Abrams mystery box stunt, there’s nobody in the cast who could possibly be playing the role of a sage 60-something female Jedi. I mean how is this not a no-brainer for Lucasfilm? How is that not a drop dead easy way to build continuity between the Star Wars television and film canon?